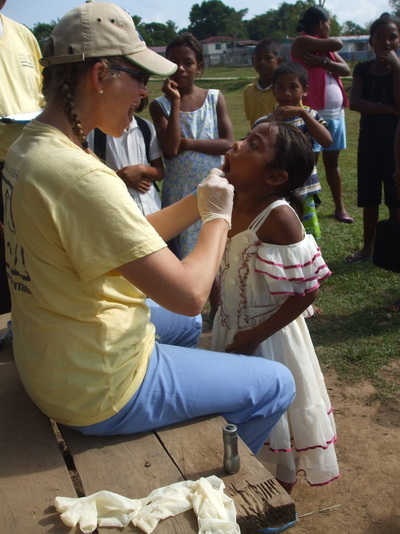 The focus of this quarter’s trip to Nicaragua was to continue work to improve the dental health of the children living in towns in the territory of Andres, which runs along the Coco River in the Northeast corner of Nicaragua. 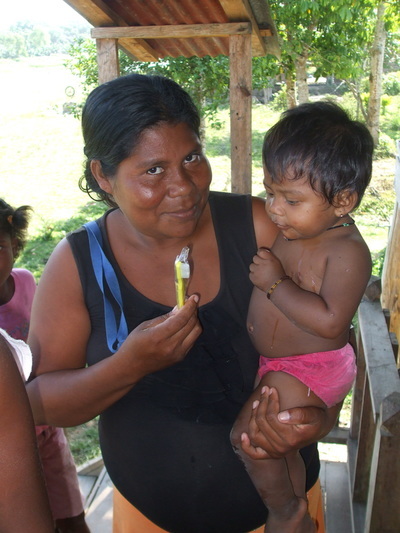 This area, populated by indigenous Miskito Indians, is extremely remote because many of the towns are only accessible by river. We started working in this area in 2013, extending our project from the more eastern lying territory of Bilwaskarma, where we have worked for over 5 years. It is very difficult to succeed in delivering aid of any sort to the 13 towns in Andres due to accessibility and communication issues. 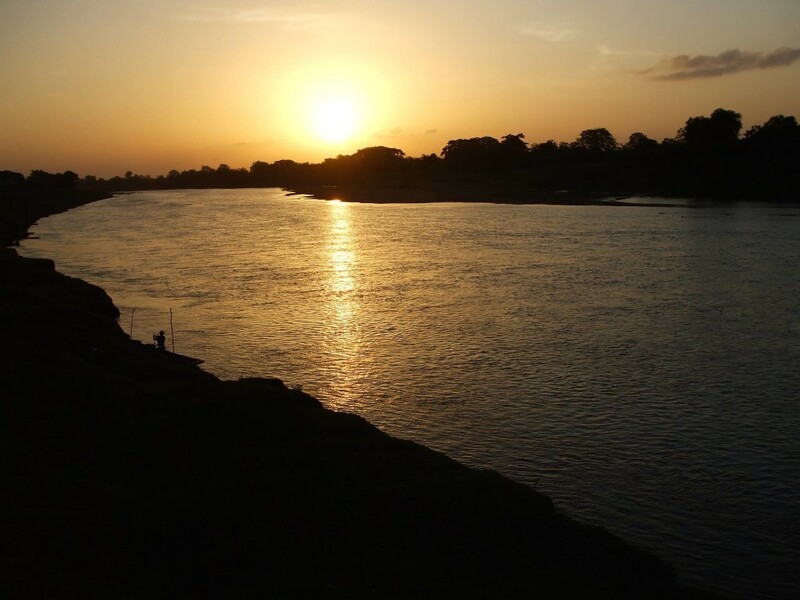 There is no running water, no electricity, no doctor or nurse present in over half of the towns, and since the towns are separated by vast expanses of water, people that are ill are frequently unable to obtain medical help. 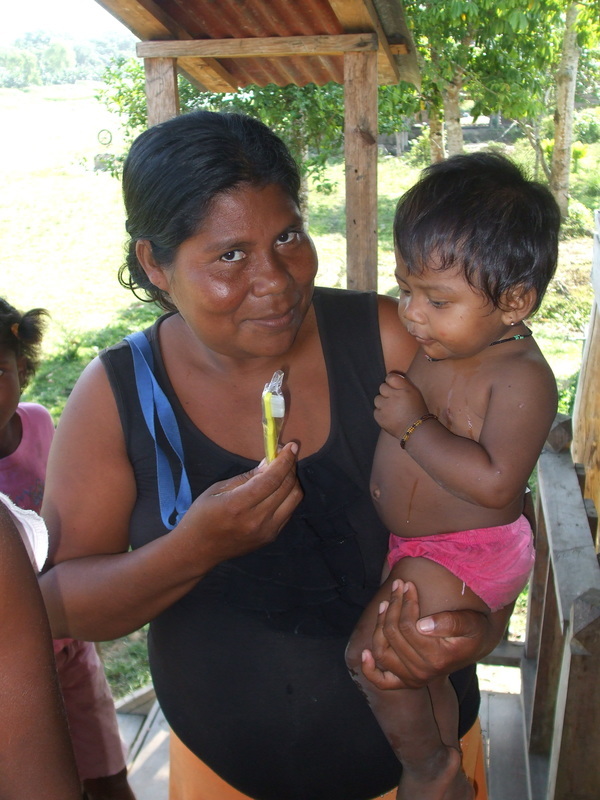 Although medical care is available free of charge in Wespam, without money, transportation to this city is impossible, and very few people living in Rio Abajo have any money to speak of, as there are no jobs locally except for farming and hunting. Magnifying this issue is the singular lack of interest by the Nicaragua Ministry of Health in providing medical care to the people living in this territory-they are underserved by both physicians and dentists, there is no coordination of vacation time taken by medial professionals so that villages are frequently left totally without recourse in the case of an emergency, and even if a doctor or nurse is present, they have an extremely paltry supply of drugs available to them on hand. 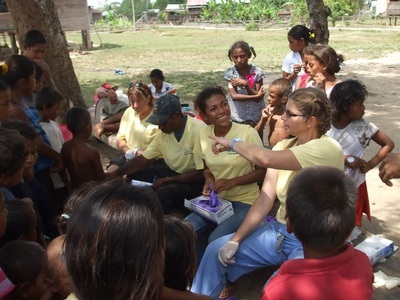 To further educate villagers about the importance of dental hygiene and to give them the tools to do so. To meet with village leaders and our “promoters” that work in the schools giving educational lectures and further their knowledge about dental care, what constitutes a dental emergency, and how to best treat emergencies when they have no access to dental care (which is essentially all of the time). To have our locally trained “dental care providers” extract any teeth, which were infected and/or causing severe pain. To advance knowledge of our program and discuss with villagers how it is working for them and listen to any suggestions they had for improving our program’s efficacy. To build a dental clinic to be located in the village of Bilwaskarma. Doing so, we were able to offer work for 8 men over the course of 2 weeks, which provided a nice little boost to the local economy. To monitor the progress of the training of the students we currently have in training with the ministry of health to become fully “capacitated” to pull and fill teeth. To hold our annual educational meeting for village leaders to further their knowledge of dental issues, distribute Save Their Smiles shirts, and reading glasses that had been donated and purchased. There is nowhere to buy glasses anywhere in this area, so it can be difficult for many of the leaders to fill out the dental and census forms that are part of their work. ​Looking back over the week, I can honestly say that we accomplished most of these goals, and a few extra as well. One of the issues that became very apparent when we were in the village of Klampa was the complete lack of medical care. Although there is supposed to be a midwife in each village, the midwife in this village is apparently too old to work anymore. Although there have been several courses given to educate local women to be midwives, the current population of midwives, who are almost all elderly, are reluctant to help provide experience and training to these younger women as they fear a loss of status in the community. Theoretically, there should have been a nurse in Andres but he had left the area for 2 weeks, leaving all 6 villages completely uncovered. There was supposed to be a MINSA doctor stationed in another town, but he too had left the area on vacation, so there was no one to turn to when there was a post-partum crisis. While we were holding our dental clinic in Klampa, a man came galloping in on a horse to tell us that his wife had given birth 3 days prior and was still unable/unwilling to rise because she felt like her insides were falling out. Luckily the baby was doing fine, and it turned out that she just had a retained placenta, so we were able to help her and the story had a happy ending, but it could have ended very differently. In addition we met a man who had been injured by a tree that fell across his thorax, and a baby with a severe pustular infection over her entire body and skull, neither of whom had the money needed to take a lancha to a the closest community with a medical presence. Later that week, during our Dental Health Day we had the opportunity to discuss the situation with village leaders, nurses and promoters from the territory of Bilwaskarma, and a decision was made to speak with MINSA about being sure to arrange that medical care providers were forced to communicate and coordinate amongst themselves so that people were not left totally bereft of help. Hopefully, this will actually happen, but I will be sure to check in on our next trip. In addition, we spoke about the possibility of buying a boat to serve as a water ambulance to transport ill, or injured people, as well as pregnant women to Wespam to receive care in a timely manner. There are many factors to weigh in how this can best be done, but after a rather spirited discussion, it was decided that the best option (both because of being the cheapest option, as well as the fasted option in terms of getting it up and running) was to ask a local motorist with an engine on his lancha (dugout canoe) to transport people as needed. MINSA agreed to pay for gas, and Save Their Smiles will attempt to generate funds to pay for the motorist’s time. Large quantities of gasoline would need to be transported down river, though, as there is no gas available anywhere west of Wespam, so there are still multiple issues to be worked out before this plan can come to fruition. The dental clinic is 90% finished. 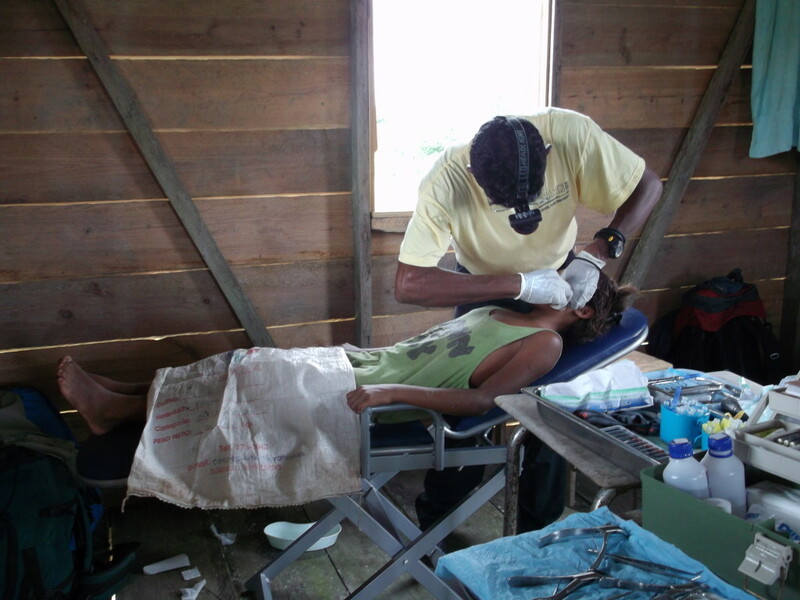 Our doors will open soon so that we can provide regular dental care for the people in this territory. Hopefully, we will eventually be able to build a clinic in the more distant territory of Andres, but this would involve bringing in a generator or some kind of solar panel to provide electricity, which is in and of itself a full-time job to make happen. Anyone well versed in solar panel would be very welcome! 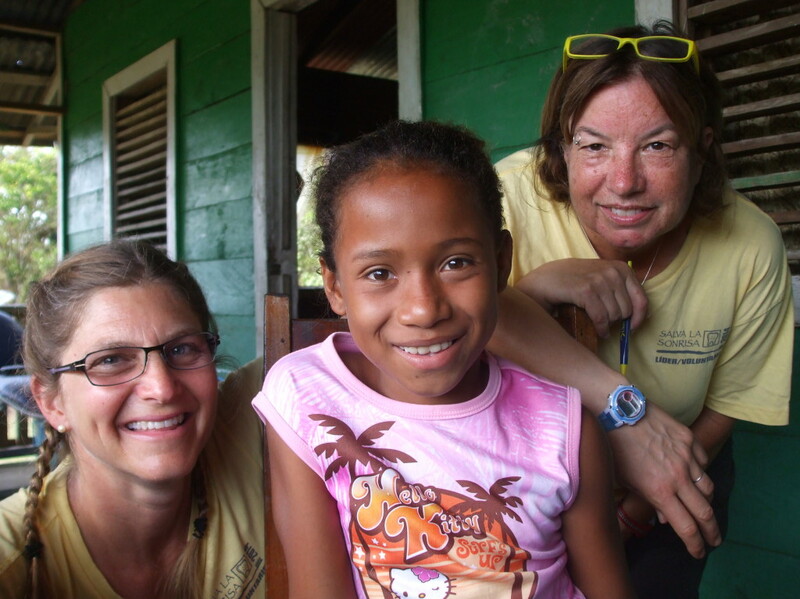 On this trip, 594 children were triaged, received a fluoride application and a toothbrush. 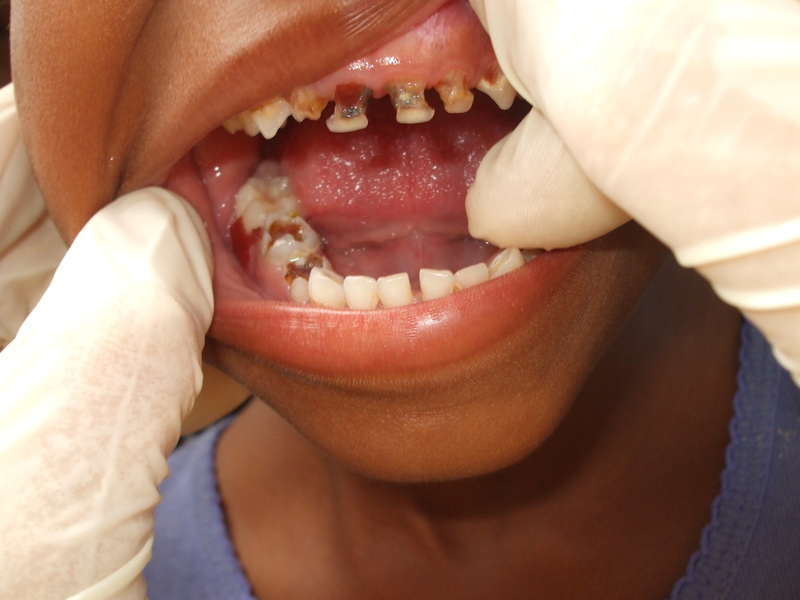 Of these 594 children, 74 required extractions of severely abscessed teeth, with a total of 121 teeth being pulled in the villages of Utlahmasta, Boom, Sawa, Living Creek, Klampa, Andres, and Kiwastara. The Dental Education Day was successful this year, as opposed to the November trip when there was so much rain the whole day that no one could hear a word of the lecture. This trip, I also came prepared with multiple handouts in Spanish that the leaders and nurses could use to educate themselves, and then the parents in their communities. They also received a Save Their Smiles tee shirt to identify them while working, as well as toothbrushes and toothpaste for their families, and reading glasses if needed. Leaders also were able to identify specific areas of concern (fluoride supplies have run out), many of them need additional blank patient records and/or census forms, as well as pens). 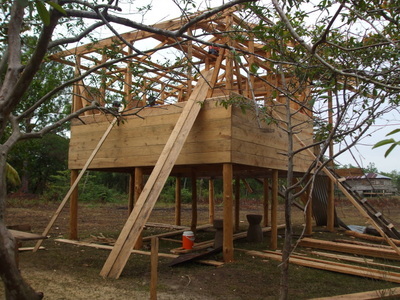 Needs were noted and will be filled as soon as supplies can be send from Nicaragua. We imported a bicycle wagon to be used to carry dental supplies village to village. It is sturdy, has a waterproof cover, and can easily be pulled behind a bicycle or even pulled by hand. We still need to obtain two tents for our promoters in Rio Abajo, as well as two large backpacks for them to carry gear in, since the area is not bicycle-able. We discussed finding an additional woman to serve as a promoter in Andres with Nerida Jackson, as I am very uncomfortable having her work alone. I will speak with Clara Mueller in regards this decision, but did not do so this trip as she was so ill.
Because I care deeply about doing good (rather than creating problems), I truly spent a lot of time thinking about both sides of the issue. In addition, I consulted the leaders as well to gather their input and ideas. Two letters were written together with the leaders describing the perceived pros and cons of the two options, and then the letters were made available to be signed in order to assess community comment. I clearly stated that leaders and nurses should feel comfortable signing whichever option they most believed in, and that the reason that I was asking was because I truly wanted to know their thoughts. I will send scanned copies of those letters, but in summary, every single leader wanted the dental clinic placed within the town rather than at the hospital. As Dr. Thompson expressed to me, the biggest concern of PIH is that if we work outside of the clinic, if something happened, MINSA would not be responsible for providing care for that patient, as we “caused” the problem. I also understand that because Save Their Smiles kind of operates under the umbrella of PIH, that any issues that we may cause could blow back negatively on PIH. That said, this is the first trip we did not have a licensed dentist with us, and that only occurred because my dentist from the states cancelled out at the last minute. The schedule had been made, and the villagers had been informed of our upcoming visit. In addition, there had been an extremely negative reaction from the towns in el Rio Abajo that we were unable to reach on our November visit, so we felt it was very important to show up as previously planned. From this point on, we will refrain from pulling any teeth until Polancio Dinking and Nerida Jackson complete their capacitation (a question of approximately 1 week and 4 weeks). In the interim, we will fill cavities for children at no charge at our dental clinic when it is finished, as Polancio completed this capacitation several years ago. In addition, Save Their Smiles should receive our 501(c)3 number sometime in the near future, so then PIH does not need to feel threatened in terms of liability. I hope, however, that we can continue our cooperation with each other, as we are serving the same community and have the same goals in terms of improving quality of life for the Miskito. I hope that you can understand why we want to have our own space. It is not that we want to be separate from you, it is just that it is not working for us as is. I have heard from both Patricia and Freecia that in their opinion, having the dental clinic at the hospital is working fine and is the best option for providing care, but as a person on the receiving end of trying to set up and maintain a clinic which is accessible when I need it, I can tell you that that is not my experience. Every single time I come, it is a hassle dealing with the key issue, not to mention the fact that our space keeps getting moved, and that there is no electricity up in that part of the hospital, so we have to drag our equipment out every time we want to use it. Also, it seems quite a bit strange to say that we are covered liability wise if we operate at the clinic while in Bilwaskarma, as over 90% of our work is done out in the other, more far-flung communities, and that never seemed to be a problem for PIH in the past. In summary, if we can only extract teeth in Bilwaskarma, we will have to abandon the rest of the communities, leaving them in pain, with the possibility of severe systemic disease caused by untreated abscesses. Is this really a choice we want to make? I am including some photos of our trip, as well as of the Dental Clinic in progress, and I invite you all to take a stroll down the road to visit it in person. It is a pretty cool space. I am also speaking with Mike Ramirez about forming our own NGO in Nicaragua as soon as our charity status in the US is finalized should PIHOM desire to fully sever ties with Save Their Smiles. I think it would be a sad end, however, as in a perfect world, this redundancy in cost and legal work should not need to happen. I firmly that the mission of Save Their Smiles nicely complements the excellent work PIHOM is doing in this area, and hope we can continue our association. Happy Mom and super-cute baby. Taking care of those teeth from day 1 is the most important of our project. Getting closer to being finished. The clinic will be a place of beauty and light. We are going to paint the inside sage green, and put up photos of children who have received treatments. 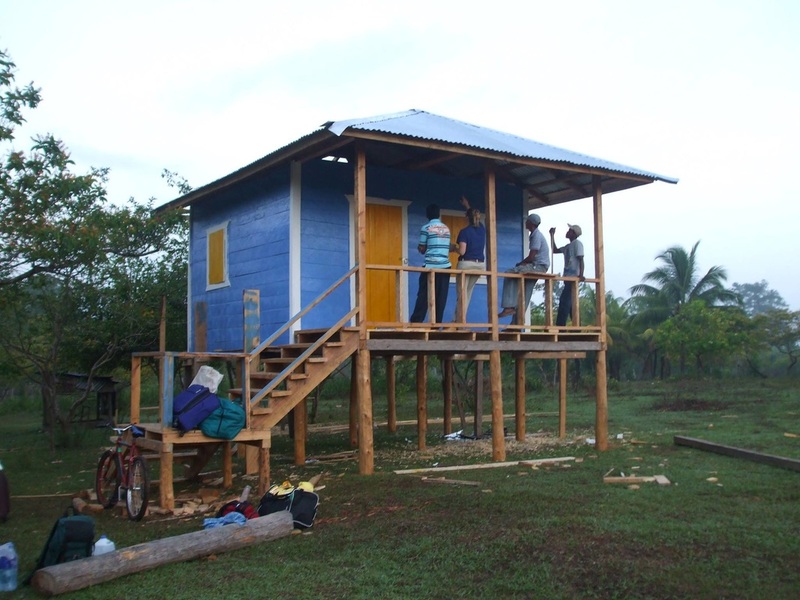 Eventually, we hope to build a similar clinic in Andres. Polancio, administering lidocaine in preparation to fill a cavity. Work in progress. This will be one tooth we won’t have to pull! Kiwastara: We focused on “meet and greet” in this town, as the villagers seemed quite wary of us at first. 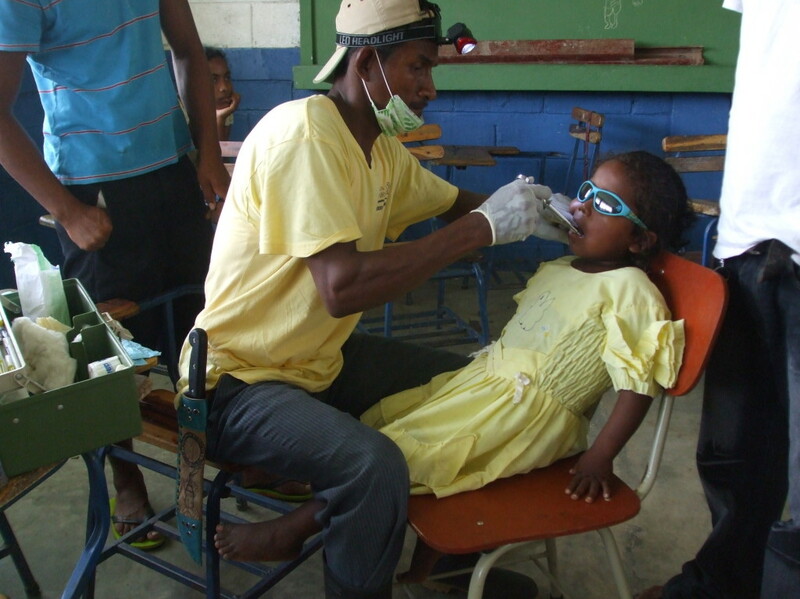 Once they realized we could help them with dental pain, they approached us and let us apply fluoride and teach them how to brush. Our promoter, Nerida, as well as the rector of the schools, will continue education in this arena so that when we return, we can hopefully pull teeth. This is the best part of the project. Spending time with the kids. The end of the trip… What beauty, even in the face of such deprivation. I am lucky to be able to experience a mission like this, and to be able to help. I feel truly honored.